BALTIMORE, Md. (Jan. 26, 2019) -- Kyson Rawls (St Georges) had a career-high 21 points and Sherwyn Devonish-Prince Jr. scored 16 and Morgan State beat Bethune-Cookman 77-71 on Saturday to end a two-game skid. "It was a good win for us bouncing back from that North Carolina trip," said Rawls. "It felt good achieving a career-high tonight," added Rawls, who eclipsed his previous high of 20 points scored against Savannah State on Jan.7. The sophomore shot 5 for 9 from beyond the arc and was a perfect 6 for 6 from the free throw line. "My teammates did a good job getting into the paint and I was ready to shoot," added Rawls. 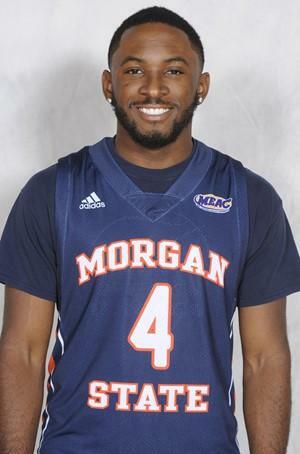 Malik Miller and David Syfax each scored 10 points for Morgan State (8-12, 3-4 Mid-Eastern Conference). Martez Cameron distributed five assists and now has 401 for his career. The Bears lead the all-time series 35-26. The Bears trailed 31-25 at intermission but exploded for a season-high 52 points in the second half. MSU tied the game at 35 on a Cameron free throw at 16:02, and later took the lead for good on one of Rawl's five treys with 12:43 remaining. MSU extended its lead to 10 on a layup by Devonish-Prince at the 7:57 mark. However, the Wildcats mounted a 9-0 run to tie the game at 62 on Shawntrez Davis' three with 3:14 remaining. MSU made the most of its free throw opportunities down the stretch, sinking 11 of its last 12 free throws, to close out the victory. Cletrell Pope tied a career-high with 24 points and set a career-high with 22 rebounds for the Wildcats (8-12, 3-3). Soufiyane Diakite posted a double-double with 17 points and 11 rebound and Malik Maitland 13 points. Bethune Cookman saw its two-game win streak come to an end. MSU scored 23 points off of 23 forced turnovers, and outscored the Wildcats' bench by a 37-24 margin. MSU returns to action on Monday (Jan. 28) when they host the Florida A&M Rattlers (7-14, 4-2). Tip-off at Hill Field House is scheduled for 7:30 p.m.